SAP Analytics Cloud (SAC) is a best-in-class SaaS solution that combines all the analytics functionalities (Planning, Predictive, Business Intelligence and more coming soon such as Governance Risk and Compliance - GRC) in one intuitive user interface, saving time and effort while making better decisions. Internally code named Project Orca, SAC was formerly known as SAP Cloud for Planning, SAP Cloud for Analytics and SAP BusinessObjects Cloud. SAP's goal to be the cloud company powered by HANA has been revolutionizing the software market for some years now and SAP Analytics Cloud is not the exception as it is buil on SAP HANA Cloud Platform. This solution started early in 2015 with the introduction of SAP Cloud for Planning, and with it's success, along with a rich road-map, it became SAP Cloud for Analytics and now it has been rebranded to SAP Analytics Cloud. How does SAP Analytics Cloud Works? The main structures of SAP Analytics Cloud are called models. These models contain dimensions which are hierarchical structures where organizations can manage their Accounts, Organizational Structure, or any other parameter their need to plan or evaluate results. There are two type of models in SAP Analytics Cloud: Planning and Analytics. As their names indicate, the first type allows users to execute planning activities within those models while the second type is a "read only" structure that allows user to perform analysis with the data gathered. Analyzing the data is as simple as selecting the cells on the spreadsheet and asking SAP Analytics Cloud to create a chart with it. The application will analyze the data and recommend the best way to visualize it. Users can then modify the chart type, add or modify the format and then share it by adding it to a presentation that can be completely formatted to meet any branding requirements. On the planning side, SAP Analytics Cloud allows users to configure formulas for different accounts, manage currency conversion tables as well as allocations. With SAP Analytics Cloud SAP is proposing a simple solution for that problem, the main goal is to give the business users the right set of tools to cover that entire process in an easy way without creating additional work for the IT team. SAP Analytics Cloud provides an intuitive interface that empower business users to perform tasks simpler and faster, with functionality that resemble the tools they already use to facilitate adoption. All this is possible within SAP Analytics Cloud and organizations can get up and running quickly thanks to a SaaS implementation. SAP's main focus has been in removing complexity and providing an all-in-one application. 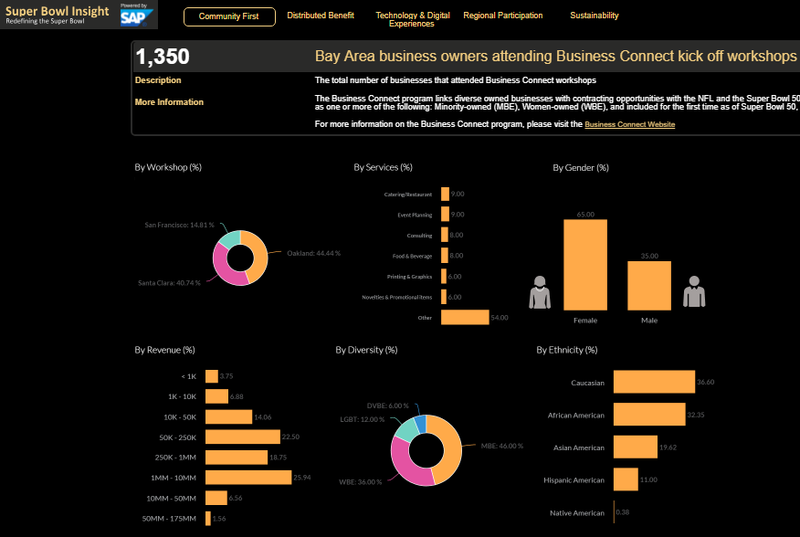 Part of the functionality offered by SAP Analytics Cloud can be seen in the Super Bowl 50 Host Committee website with their Super Bowl Insights. SAP Analytics Cloud is offered in two modes, Private and Public editions. Both Editions are hosted with the difference that the Private hosts only one customer while the public offers multi-tenancy. From the end user's point of view this will be transparent, but license cost is higher for SAP Analytics Cloud - Private Edition. SAP Analytics Cloud, BI: they can create any report, including the Data Views, but they can't use the Planning Models.